As part of our October “Metastatic Monday” blog series, we will be publishing stories from medical experts, our clients and their loved ones who are (or have been) faced with a metastatic breast cancer diagnosis. Metastatic Breast Cancer, also known as Stage IV, is cancer that has spread outside of the breast to other organs such as bones, liver, lung or brain. 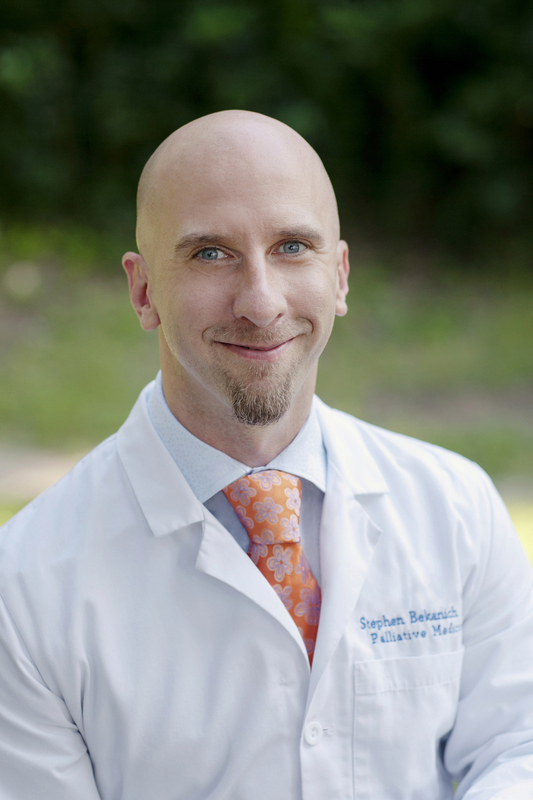 This week’s blog is authored by Dr. Stephen Bekanich. Dr. Bekanich is a BCRC Board member as well as a Seton physician who specializes in palliative care. As the father of three children and the loving husband of his wife and local plastic surgeon, Amy Bekanich, Dr. Bekanich is also a family man and has first-hand experience of what it can be like caring for a loved one with a serious illness such as metastatic breast cancer. In his piece below, Dr. Bekanich writes from his own personal perspective, explaining what we need to know about palliative care and why we should consider it for ourselves and/or our loved ones when facing a serious illness. Learning that you or your loved one has breast cancer can be a scary, life-changing experience. Emotions run wild. Questions and fears abound. Will I be in pain? How much time will I spend in the hospital? Who will help my family? Palliative care is a medical specialty that works with patients and families to help lessen the sting of a serious illness. Palliative care teams surround patients and families with an extra layer of support to promote physical, emotional and spiritual well-being during a period of immense stress and uncertainty. Before practicing in this field of medicine I was in a different specialty, one where I took care of patients who were very sick and needed to come into the hospital for emergent or urgent care. I felt as though I was a doing a good job meeting the needs of the patients and families we served. I was mistaken. I grew up living with my grandparents, Ama and Pop. They were my childhood heroes (and that didn’t change once I became an adult). I am certain that their generous love catalyzed who I am today. It was during my early years as a physician they were both diagnosed with serious illnesses. Ama with breast cancer, and Pop with dementia. I watched as they went through these illnesses. If you’ve seen someone you care about go through this then you know that words are inadequate to describe what the patient and your family went through. Even though I am a physician I struggled to find a way to help them. While I knew there must have been easier paths to make this journey I didn’t know how to find them. These skills were not taught in medical school. I became determined to personalize the focus of my professional life so that I would excel at helping future patients and families avoid what I couldn’t with my own. It was then that I left my specialty and pursued palliative care. I’ve now had the privilege of caring for thousands of people with serious illnesses. I can’t emphasize enough what a difference it makes for everyone involved. Palliative Care (PC) is a multidisciplinary approach to caring for both patients and family members/caregivers throughout serious illness. The goal is to prevent or alleviate suffering and improve quality of life. It is appropriate at any age, at any stage in a serious illness, and can be provided along with curative treatment. PC provides dignified and culturally appropriate care to patients in a manner that prioritizes patient/family preferences. The most common interventions include: 1) medical management to optimize how a patient feels (treating pain and other distressing symptoms), 2) conducting family meetings with patients, caregivers, loved ones, and medical professionals with the intent of elevating the exposure, education, and communication that is essential for patients to make good decisions as they go through serious illness, and 3) psycho-social-spiritual support for patients and their families. Some patients and even many doctors confuse palliative medicine with hospice, a form of palliative care for people in the last six months of life. Palliative care is NOT limited to hospice and may be offered along with curative treatments, such as chemotherapy, at any time in the illness. Asking for palliative care does not mean that you or your doctor has given up on you or your recovery. The epidemiology of aging and advanced illness. America is aging and at the same time becoming more ill. The 4 most common causes of adult decline in the U.S. are from cancerous, cardiac, progressive lung, and neurologic diseases, and become more prevalent as the population ages. The region encompassing Austin, Texas has the 2nd fastest growth rate for people over the age of 65 in the U.S. There is concern that our current infrastructure, including healthcare, is inadequate to support a growing senior population. Poor patient experience as a result of serious illness. For almost two decades the medical profession has been aware of uncontrolled pain, anxiety, insomnia, shortness of breath, nausea and vomiting, depression, fatigue, and other treatable symptoms that haunt patients on a daily basis. Despite this awareness little work has been done to create widespread change– even though studies support that when trained teams aggressively treat these symptoms, they improve significantly. Shifting ideology of medical care. Healthcare providers have been trained to be disease-centered rather than patient-centered. The “procedure” performed by PC is the family meeting where empathy, conflict resolution, active listening, and other techniques are employed to create a more holistic, person-centered ultimate outcome. Caregiver syndrome. There are over 40 million caregivers in the US who share in responsibility for the wellness of patients. These care givers are typically female, employed, rate their own health as poor, and likely to be family members. Studies show that they feel neglected in the healthcare journey of the patient. They are not satisfied with care for serious illnesses, would like to voice their concerns more than they are able, want to feel included, and wish for more access to providers. Caregivers also have worsening health, higher healthcare costs, and increased risk of death compared to non-caregivers. PC is the only medical specialty that defines itself by treating the patient and caregiver as a unit and has a formalized, evidence-based approach to dealing with caregiver concerns. Recognition and presence of PC in the healthcare industry. As palliative care has been demonstrated to decrease suffering, improve satisfaction, and support caregivers a plethora of organizations, professional societies, and media have embraced palliative care as a champion in healthcare reform. Examples include the Joint Commission, American Society of Clinical Oncology, American College of Cardiology, and the Institute of Medicine. Palliative care not only helps people live better with less pain and fewer symptoms, studies have shown that it can even help patients live longer. For example, a landmark study of 151 patients published in The New England Journal of Medicine showed that people with cancer getting early palliative care, in addition to regular medical treatment, lived three months longer, compared with those given standard care. Research also tells us that palliative care is cost-effective–resulting in less time in the hospital, shorter stays in the ICU and reduced hospital re-admissions. Palliative care has an essential role to play in improving the quality of life for Central Texans facing breast cancer — and the people who care for them. Palliative care is available to people of all ages and at any stage of an illness. For more information on palliative care visit www.getpalliativecare.org. For more information on metastatic breast cancer, please visit www.mbcn.org. BCRC’s Locally Pink campaign offers you the chance to make a big difference – today – for women in Central Texas who are living with metastatic breast cancer.